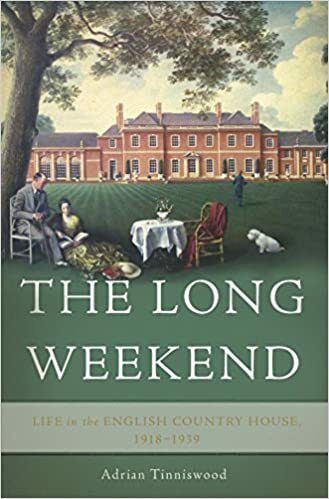 I picked out The Long Weekend: Life in the English Country House, 1918-1939 from NetGalley to review here as the country house has such a prominent place in classic and historical fiction - think of how many mysteries wouldn't exist without characters being cooped up together for a country weekend! The book is exhaustive - Tinniswood goes through all the aspects of the country house itself, from architecture to interior decoration to sale to (royal, aristocratic, and common) owners, with detailed descriptions of how these went down at various specific estates. The social aspects, unfortunately, don't seem to get as much time as the others (or perhaps the architecture and interior design chapters simply seemed very, very long?). Country house parties are dealt with at the very beginning, and then at the end there's discussion of gay country house owners, hunting and fishing, the servants, politics, and the collapse of this culture during WWII. Ultimately, I'm not sure how much it enriches the period-drama-fan's view of country house society beyond what you've absorbed from period novels and shows like Brideshead Revisited and Downton Abbey and the like - it confirms rather than enlightens, and gives specific context to generalizations you already knew. But if the reader is researching the period, all of this specific information is extremely helpful.